Beth Ditto will perform at Union Transfer on Sunday, March 11, 2018. One of the most exemplary things about Beth Ditto, the post-punk priestess, Southern belle and former singer for Gossip is that you can ask her about damn near anything. As forthright in conversation as she is in her music (her sinewy debut solo album "Fake Sugar," for instance, which brings her to Union Transfer on Sunday night), Ditto has long been a blunt force of nature when it comes to LGBT rights, marriage equality and matters of female form, size and stature in fashion and the workplace. "Nothing is too serious or too shallow to discuss," she said with an Arkansas twang in her voice and a giggle. Her glorious brown-black bob? She's got two hairdressers. "One in Portland and one in London," she shared. "Yes, darling, I'm particular about few things, and hair is one of them." She teased that her hair team is trying to get her to go au courant (which means 90s hair-dos and mullets), but she doesn't seem to be having it. "I have already been there and done that," she bristled. "Just cut my bangs and leave the back long." The other thing she is totally hands-on about is clothes and her eponymous fashion line for which she's designed plus-size tunic tops, silk jumpsuits, corset tees and more. "I don't want to do anything that seems contrived or is over-rehearsed," she said. "I may have a stylist but I handle my own. I can't do what people want me to do - not because I'm a brat. I just don't ever want to seem insincere. "I know I might not always be right or that something I want might not be for the best. Maybe it's tacky or bad. At least I know it was my decision." Ditto likes just jumping into the fire; it's about being spontaneous while remaining ethical. "I want to be the change I want to see in the world. I can contribute to the solution," she said. That's been her bag all along. Whether singing out on older songs such as Gossip's "Standing in the Way of Control," new songs such as "Fire" or speaking out on body positivism or gay rights, she has forever been at the forefront of changing how we view feminism and gender politics. "Now, I feel as if I got to be a part of these movements from early on," said Ditto. "That's what you do it for. Not for recognition, but for things to be better. "I'm no professional activist - I'm not great at studying - but these things deeply affect my life, and the lives of friends and people I love. Plus, it's just impossible not to be vocal. I got the ball rolling when I was young, and it's cool to see people now - tons younger than me - pushing forward with their own insight, their own blogs and their protest." Chat with her about marriage equality, and the fact that she's been married to her longtime partner for five years, and Ditto will start to laugh. "What's funny about that is I am getting a divorce," she said. "We thought we knew what we wanted and what we could be, and we're not. That's OK. And now, I'm dating the sweetest person and my wife is very good about us moving on." Ditto said she loves her life as "a rad activist," and someone who makes solo music for a living. When it comes to the twanging, Southern Gothic pop of "Fake Sugar," she has come to realize that much of what she recorded for that album was rooted in deep sadness. "I was really heartbroken when I wrote it," she said. "It wasn't my usual political stuff. I was all consumed by the struggles of a married relationship, even the struggles of having busted up with Gossip. "Now, it feels great to be able to admit that, and I can perform the songs of 'Fake Sugar' with that truth behind me. But now, I can't wait to get back to the studio and write that next record because I'm in such a great space." 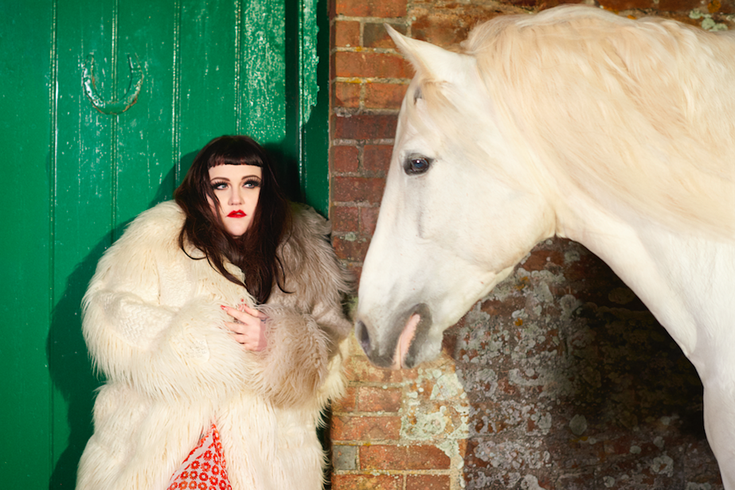 Beth Ditto appears Sunday, March 11 at Union Transfer, 1026 Spring Garden Street. Tickets are $20. Show time is 8 p.m. For more information, call 215-232-2100 or click here.